The Sense of Unending: Queer Chronicity in Melville’s “Bartleby the Scrivener” and Gertrude Stein’s “Melanctha”. 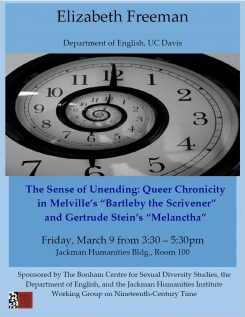 Please join us for a discussion with Elizabeth Freeman (Department of English, UC Davis) on The Sense of Unending: Queer Chronicity in Melville’s “Bartleby the Scrivener” and Gertrude Stein’s “Melanctha”. This event is sponsored by the Bonham Centre for Sexual Diversity Studies, the Department of English, and the Jackman Humanities Institute Working Group on Nineteenth-Century Time.